Ever seen this happen? 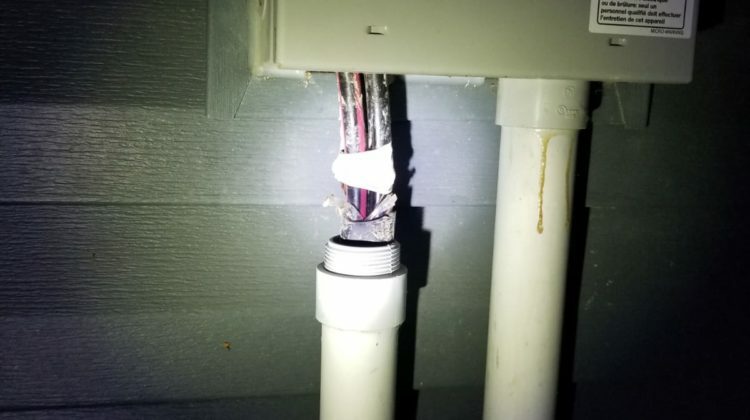 The ground has settled so much on this house, the main feed is pulling right out of the meterbase. This can be caused by snow-filled backfill, or improper underground procedures when installing the main cable. What happens next? The meterbase blows up and you have loss of power and major fire hazard issue. If you see this happening, call us immediately! We fix this kind of thing all the time, we’re listed with EPCOR as one of their recommended electrical companies for these kind of repairs. You are provided generator power for the day of the repair and everything is resolved promptly and efficiently. It’s -30 today, I sure hope nobody has this kind of issue with these temperatures!